Each morning our school's little yellow bus leaves the west side of Iowa City to arrive at school ten minutes later. Less than 8 miles outside of Iowa City, the community of Cosgrove sits on a small hilltop in Johnson County. As you take Melrose Avenue west, it becomes the "IWV Road" and you quickly notice it does not take long to reach rural Iowa. 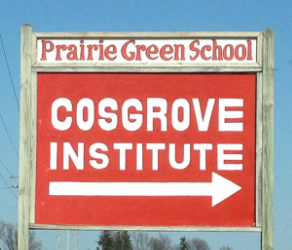 After driving a few minutes over rolling farmland, you will see the Prairie Green School sign on the south side of the road marking Cosgrove Road. Once you turn south you will see St. Peter's Church steeple reaching far into the sky. The church was built in 1893 and the congregation built their own school (K-12) in 1913. The school buildings were later purchased by the State of Iowa and the gymnasium and library were added in 1954. After 1990, the school was no longer in use and the state put it up for sale. A group of local residents undertook to buy it in 1991. It was re-named The Cosgrove Institute and it has served well as a community center ever since. Artists rent the old classrooms as studios, local groups rent out the library and/or kitchen, and youth sports programs rent the gym on a regular basis which helps to maintain the building.